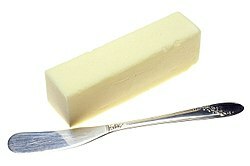 A stick of butter (food made from cream) with a butter knife. From Middle English buter, butter, from Old English butere (“butter”), from Proto-Germanic *buterǭ (“butter”) (compare West Frisian bûter, Dutch boter, German Butter), from Latin būtȳrum, from Ancient Greek βούτῡρον (boútūron, “cow cheese”), compound of βοῦς (boûs, “ox, cow”) and τῡρός (tūrós, “cheese”). Compare Avestan 𐬌𐬭𐬌𐬏𐬙‎ (tūiri, “curdled milk, whey”)), from Proto-Indo-European *tuHrós (compare Middle Indic [script needed] (tūra, “cheese”), Russian творо́г (tvoróg, “curds, soft cheese”), Old English þweran (“to churn”), geþweor (“curds”)). A soft, fatty foodstuff made by churning the cream of milk (generally cow's milk). Any of various foodstuffs made from other foods or oils, similar in consistency to, eaten like or intended as a substitute for butter (preceded by the name of the food used to make it). (obsolete, chemistry) Any specific soft substance. (transitive) To spread butter on. To move one's weight backwards or forwards onto the tips or tails of one's skis or snowboard so only the tip or tail is in contact with the snow. (slang, obsolete, transitive) To increase (stakes) at every throw of dice, or every game. Someone who butts, or who butts in. […] these animals lacked self-correcting mechanisms of the kind seen in modern head-butters such as goats and big-horn sheep that would have kept the tremendous forces aligned with the rest of the skeleton. to heap the potatoes [onto something]. “butter” in le Trésor de la langue française informatisé (The Digitized Treasury of the French Language). First-person singular present of buttern.